Global Fact 4, the annual gathering of fact-checkers around the world, is taking place July 5-7 in Madrid. Each day, we’ll be collecting noteworthy moments from the summit, from social media interactions to memorable slides. Below are the highlights from Day 1 of the conference. The International Fact-Checking Network informally launched Global Fact 4 with a series of workshops about best practices for fact-checking, innovative tools and platforms for fact-checkers and the IFCN Code of Principles. Conference attendees can use #GlobalFact4 to contribute to the international dialogue surrounding fact-checking, fake news and freedom of the press. PolitiFact editor Angie Holan and Chequeado director Laura Zommer lectured 55 emerging fact-checkers on fundamental dos and don’ts of the practice during the Fact-Checking 101 workshop. For a claim to be checkable, Holan said it has to be feasible, factual and relevant, with enough evidence to deliver a verdict. Holan also said any claim based on an opinion does not meet those criteria — and journalists should avoid fact-checking them. But it is not always that simple. Discerning factual claims from opinion is often difficult, Holan said. 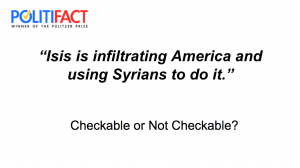 To illustrate her point, she brought up a statement from the National Republican Congressional Committee that sparked debate in the PolitiFact newsroom: “ISIS is infiltrating America and using Syrians to do it.” Was the claim checkable or not? Was it based on empirical evidence or opinion? Ultimately, PolitiFact determined there was sufficient empirical evidence to check the claim and come to a verdict: false. 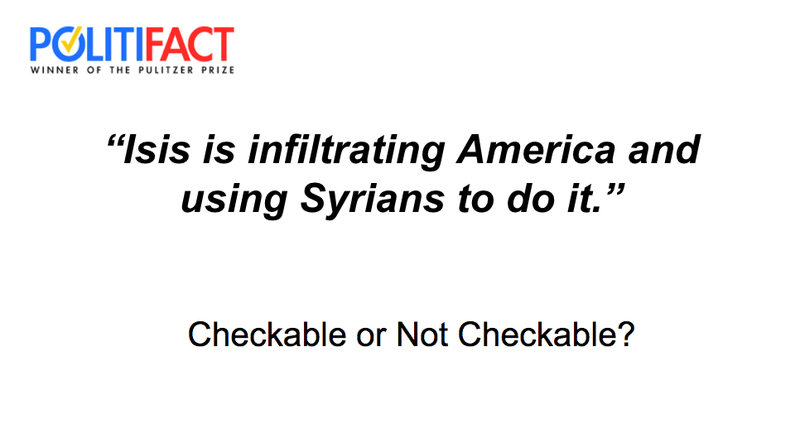 The founders of FactCheck Initiative Japan spoke with the Reporters’ Lab about the need for fact-checking in a country where government influence and fake news are infecting public debate and news coverage. Middleton, a law professor at Hitotsubashi University, noted that misinformation had long existed in the Japanese media landscape, but the public did not take it seriously until Donald Trump was elected president of the United States. FactCheck Initiative Japan is one of at least seven new fact-checking operations attending Global Fact for the first time.